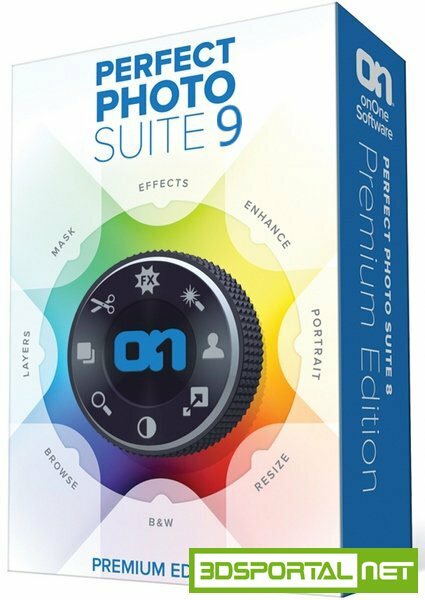 onOne Perfect Photo Suite 9.5.0.1644 Premium Edition Win/Mac » 3Ds Portal - CG Resources for Artists! OnOne Perfect Photo Suite is a set of applications from OnOne Software, submitted in a single package. Includes standalone programs and plug-ins for Adobe Photoshop. It is designed for professional and advanced amateur photographers and amateurs photos that provide intuitive use of photographic effects, portrait retouching, create and edit layered images, change unwanted backgrounds, image resizing, color depth, sharpening, adding effects boundaries. Perfect Photo Suite as well as earlier works as a plug-in for Adobe Photoshop, and now as a completely standalone application. The new version allows you to meet the major challenges of processing digital photographs, offering photographers to realize their creativity. A new Smart Photo feature, which lets you re-edit your photos — with previous settings intact — after saving and closing them. All of your editing steps are saved with a Smart Photo, so you can make subtle (or major) changes to a photo at a later date. And Smart Photos use the standard Photoshop file format, so you are assured of maximum compatibility. Faster processing; the Suite is now up to 2x faster than Suite 8 in many instances.